Desserts for Breakfast: The easiest chocolate chip cookies on earth. Ten days, two cities, tons of food. 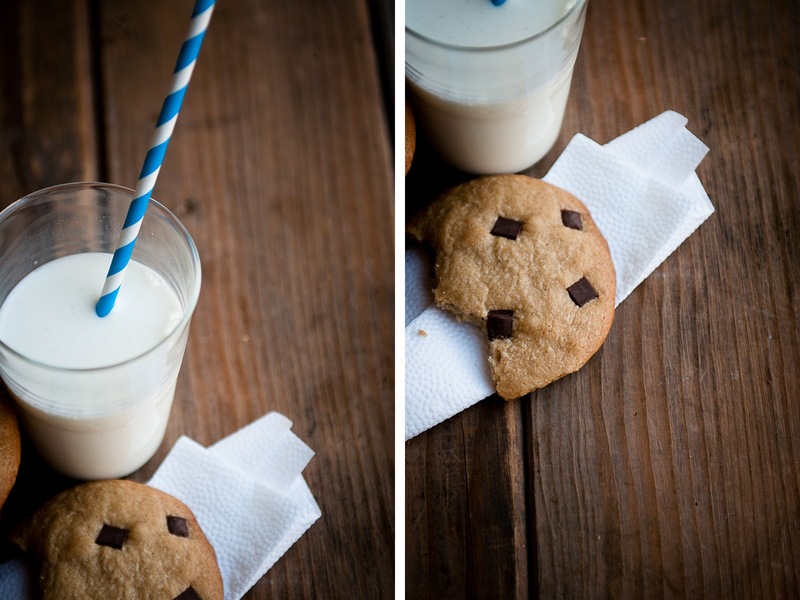 The easiest chocolate chip cookies on earth. Please tell me what your favorite eateries in Pittsburgh and NYC are in the comments below! It just so happens that I'll be in Pittsburgh at the same time as one of my good friends from college, Nate, who's located there now, has his birthday. When I asked him what he wanted for his birthday, he said that he wanted a cookie recipe, and when I asked him what kind of cookie recipe he wanted, this is the reply I got: "I want something dead simple and quick. My usual chocolate chip cookie recipe takes more effort than I'm willing to put in." My initial reaction to this was something along the lines of "Wait, wait, WHAAAAA?! How can it *get* any simpler than chocolate chip cookies?!?" But then I got to work and arrived at this recipe: the simplest chocolate chip cookie known to man and yet, so incredibly flavorful, perfectly chewy and toothy in the center, with just the slightest hint of crunch on the outer rim. The first batch of these that I pulled out of the oven disappeared within an hour. Here's how dead-simple these babies are. There are only seven ingredients: butter, vanilla, salt, brown sugar, eggs, flour, and chocolate chips. (The secret to the extra kick of flavor is letting the butter brown while melting it.) All that's required is one pot, one half-cup measuring cup, and one half-teaspoon measuring spoon. (Read: super simple clean-up). There's no annoying creaming of room-temperature butter with sugar-- just melt the butter in the pot and then stir everything in. This recipe makes six to eight large sized cookies that all fit on one baking sheet, meaning no waiting around for numerous batches, and all you have to do is plop the dough down with a spoon (no shaping of cookies required!) and they will spread themselves out to the perfect round shape. I dare to you try to make a chocolate chip cookie recipe that tastes better and is simpler to make than this! I'm not sure if they'll count virtual votes, but it will at least send the message that "nom" is alive and thriving! If you're interested in what other words have been nominated for 2010, the list should go up here sometime soon. 1. Preheat oven to 350 degrees F. Line a baking sheet with parchment paper or a silpat. Set aside. 2. In a light-colored saucepan, melt the butter. Cook on medium heat until the solids drop to the bottom and just begin to brown and the butter smells nutty. Remove from heat. 3. Stir in the light brown sugar until combined, followed by the salt and vanilla extract. 4. Stir in the egg until thoroughly combined. 5. Finally stir in the flour, and once that is thoroughly combined, let cool briefly before stirring in the chocolate chips. 6. Spoon six to eight heaps of dough onto the prepared baking sheet, making sure to leave a good amount of space between each cookie. 7. Bake for 15 minutes, until the edges just start to turn golden brown. Remove from oven and let cool on a cooling rack before enjoying. Tip: All ingredients can be measured using a 1/2 cup measuring cup and a 1/2 tspn measuring spoon. If doubling the recipe, use a 1 cup measuring cup and a 1 tspn measuring spoon instead. Well, I can tell where to get some good cookies in NYC: (1) Jacques Torres for the chocolate chip and mudslide cookies, (2) Levain Bakery for the chocolate chip, double chocolate and oatmeal raisin cookies, and (3) Bouchon Bakery for the "nutter butter" peanut butter sandwich cookies. I'm sure there are a ton of other amazing places, but those are a good start! Those cookies are fantastic. I hope to have enough time this weekent to taste this recipe! I haven't been to Shake Shack in NYC, but I really want to try their burgers, they look sublime! I love the way the chips look in these pictures. They look kind of like they're straight out of a cartoon - an I mean that in a good way! I hope you have a wonderful time, even if you are there to work. Good luck! Ahh i just posted the longest food suggestion comment but it didn't work - so this one is shorter and less thought out! sorry! Suggestions: momofuku noodle bar to warm up with some ramen; lucali or motorino or lil frankies for pizza; frank or frankies sputino for pasta; prime meats for steak. if you have another cuisine that you want restaurant suggestions for just let me know! Nom! Cookies! Love the ease of this recipe and I'll definitely have to give it a try! If you are looking for some delicious mac n cheese in NYC, head to S'mac at 1st ave & 12th. So good! Or Risotteria on Bleecker! Yum! easy or not, anything with brown butter is perfect in my book! this look so cute and perfect, thanks! Yummy! Can't wait to bake up a batch! Wow....this really is a simple cookie recip.....could probably even do it with my eyes closed....teheeee! Beautiful pictures as usual! You HAVE to go the Halal Food Cart on the corner of 53rd and 6th in NY for the best lamb/chicken and rice plate in your life. They're only open from like 10 p.m. to 2 a.m. During the day, there's an imposter food cart on the same corner so don't be fooled! Safe travels, Steph! Ditto to Primanti Bro's in Pittsburgh. You HAVE to go. It's an experience. Now that I live in AZ, I try to make my own Primanti sandwiches here at home. :) I actually can't recommend anything in NYC, but have oodles of fave spots in Pittsburgh! Lulu's Noodles in Oakland is very popular. Italian Village pizza has awesome cheese pizza ... that's in Squirrel Hill on the corner of Forbes & Shady. Pamela's is great for breakfast food & huge fish sandwiches. Wholley's Fish Market ... they serve food there, but a great place to pick up fresh seafood to make at home. If you are Pitt on the weekend, check out the Strip District near downtown. I'll start with Lower East Side because this is one of my favorite parts of the City. You probably have heard of Babycakes, a really cute gluten-free bakery. I think it's worth visiting and trying something but what I like more is Sugar Sweet Sunshine Bakery where you'll find awesome cupcakes for 1,50$ each. On the same street is Economy Candy Market, a store full of candies from around the world and lots of american oldshcool ones too. If you feel like beginning your day with a bagel instead of a cupcake, head to Russ & Daughters. This jewish shop has been open and run by the same family since 1914! I love their bagels with cream cheese and smoked salmon/ lox. If you have never had pastrami sandwich at Katz's, well, it's a must. The size of it is enormous but if you share one with someone you'll be fine;). Dessert? Across the street from Katz's is Il Laboratorio del Gelato with great ice creams and some interesting flavors. Someone above mentioned Shake Shack. Their burgers are good, fries and desserts also but the place is always packed. Anyway, you can check it out;). If you're craving for Asian food, you could visit Ktown in Midtown. I like Madangsui a lot, a Korean restaurant. St Marks in East Village tends to be a NYC Japantown but to me that place is a little too commercial. Anyways, you can find there lots of cheap Asian food and a lot of places are definitely fine. Ok, that's it, i'm sure other readers will give you some more tips:). Enjoy your trip and I'm looking forward to read your posts after visiting NYC! Mud Cafe in East Village, awesome coffee but also has delicious real food/drinks too. Lombardis in Little Italy, first real pizzeria in America... totally amazing. Have so much fun, can't wait to see what you pick! (Slash your cookies look delicious). Thank you all so much for your comments and suggestions so far! I can't wait to try everything and report back. :-) Nom! @Anonymous: thanks for catching the Tbspn typo--it's fixed now! In New York: I second the laboratorio del gelato, close to that is Porchetta (try the sandwich. DO try the sandwich) and btw the Tenement Museum in the same street as the icecream is really worthwile. The Doughnut plant: I liked it for its wide choice, but in the end they were..doughnuts (sorry guys, maybe that has to do with the fact I'm not american :-) ) The China Town Ice Cream Factory is fantastic!! Shake shack a great experience, I love the Union Square Cafe to splurge for lunch after a morning at the Farmers market. There's so much, ENJOY!!! (David Lebovitz wrote a lot on NY food in aug '10 on his blog and @ Chocolate and Zucchini you'll also find lots of tips from readers when you search on new york in the blog) Have SO much fun, NY is great! I'm a purist when it comes to cookies... my saliva glands started working over-time just looking at your photos. Guess that means some home-style baking tonight - thanks for the recipe ! Go have breakfast at Penelope in Murray Hill - Lexington & 30th (ish). I loved it! I came across your gorgeous blog today and can't stop reading! All I can say is yum, yum, yum!!! Have a safe (and delicious) trip back East! Can't speak for Pittsburgh, but gosh, you'll be in heaven in NYC! I have too many favorites, but one of my must eats when I visit home is Joe's Shanghai for their soup filled crab meat dumplings. BTW, made some chocolate chip cookies this past weekend too. I just love your recipe - simplicity at its best - I'm definitely going to try it! For sure Levain for a cookie or two (or three). I didn't get to Momofuku, but will next trip. I hope you post about the good eats! I like easy and I like cookies! Can't wait to make these! Wow! They're so easy to make! But I'm still confused about the browning of the butter. Anyway, This is the easiest cookie recipe I've ever seen.Nice! I'll give them a try! I love your blog! And your blog made me finally create my own one, so thanks! Thanks for the chocolate chip cookie recipe. It never hurts to have another recipe for these guys! i LOVE ippudo in NYC for gourmet ramen!! have fun!! I am craving for this one. My kids saw your cookies and they really want to bake some of those for their snacks everyday. I guess I should print your recipe. Thanks a lot. This is so simple but it really makes my mouth watering. I should better make some of this later on. From the department of why-didn't-I-think-of-this-before: refrigerating the dough for 5 min. before adding chocolate chips both prevents the chips from melting and makes it easier to form the cookies.